Smith & Wesson showed up to SHOT Show 2019 sporting some new looks for their Thompson Performance Center rifles and M&P 2.0 pistol lineup. The rifles, which debuted at NRAAM last year, were upgraded for SHOT with thumbhole stocks, which are available in a variety of finishes from wood stock to Hogue. The rifles have also been upgraded with heavy, fluted, threaded barrels. “For those of you who want to go target shooting, plinking, or even small game hunting, these are a great option,” a rep from Smith & Wesson told us. MSRP on the Hogue model is $497 and the wood stock version is $616. 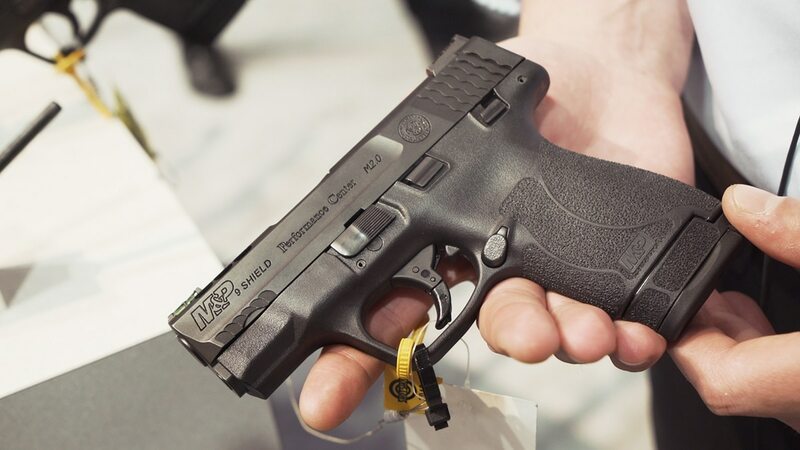 Not to be outdone by the rifles, the new Performance Center M&P also showed up to the show sporting a new slide and trigger. The slide features aggressive serrations on both the front and rear, along with cutouts to help reduce muzzle flip. You can get the Performance Center M&P with Hi Viz or tritium sights and it currently retails $539.